PT. Trindo Pratama was initially a Product Development provider and supplier of metal precision components for European market when it was established in 2003. 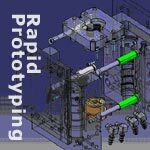 Nowadays, Trindo Pratama has become a provider of Rapid Prototyping service and expanded the wings as manufacturer in precision tool and components. Our high quality customized plastic mold, press tool, jig and fixture are highly valued by our customer from diverse industry areas such as automotive and aeronautic, household, packaging, electronic, etc. We manufacture also metal parts and components that need high precision machining and unique treatments. Furthermore, our Trading division supplies original spare parts, high quality cutting tools and precision measurement equipment. Our priority in the quality assurance reflects in our effort and investment in the test equipment and process control. We are committed to provide you with the highest quality service and strict design confidentiality.